Today I added one headstone photograph to the page for St. Mary’s Anglican Church Cemetery, Shiers Road, Harrigan Cove, Halifax County, NS. It is one of four steel crosses in a row. 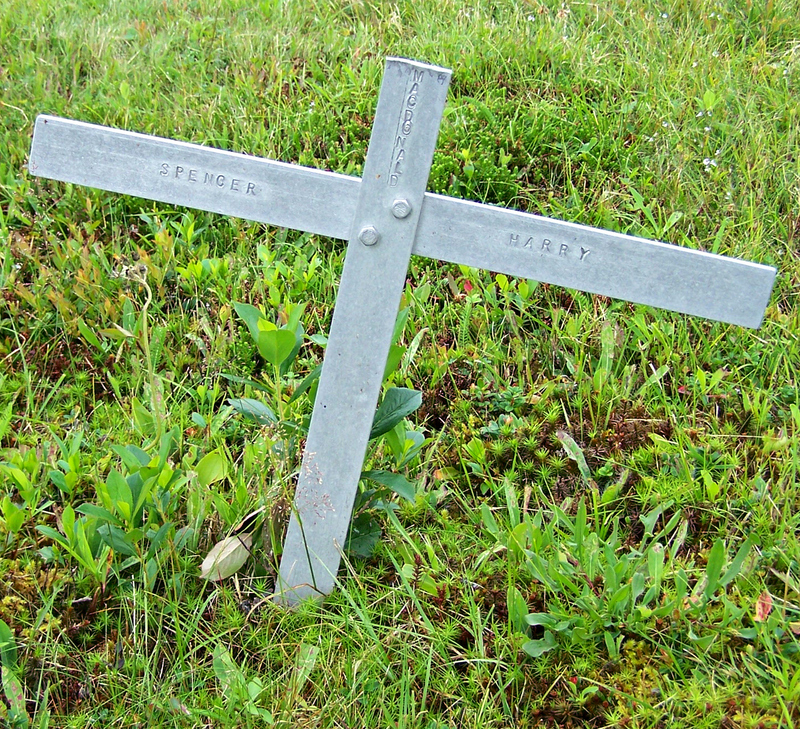 This could be Spencer Harry MacDonald, but from other steel crosses in the same cemetery, I believe the cross marks the burial for two people: Spencer AND Harry MacDonald. More than likely, they are brothers. I have not found any records to indicate who Spencer and Harry MacDonald are. The names on the other steel crosses are: Jim, Edward, Charles and Levine MacDonald. Assuming these individuals are from the same family, we might also assume the couple Levine (also spelt Lavinia in some records) and Charles are the parents of Spencer and Harry. Found in the 1891 Census is the family with the following children: William, Amelia, Daniel, Mary, Jeremiah Freeman, Annie A., Edmond, James F, Maud Julia, Adam, Freeman and Henry E. The Edmond in this group might be the Edward on the steel cross. The Henry might be Harry, and James could easily be Jim. I have not found any vital or census record with the name Spencer in the area. Hopefully, the name will show up as I continue to add information to this page, and I will be able to properly identify him. Atkins, Grace Evelyn: Born May 17, 1901 at Harrigan Cove, Halifax County, NS, the daughter of Margaret Catherine Smith and George William Atkins.